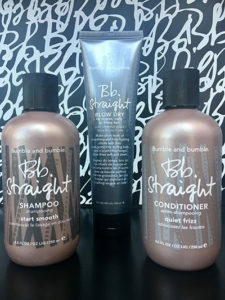 The Bumble and Bumble Straight products were developed to help maintain the hair’s integrity, allowing anyone to customize the straightness they need with their type of hair. These products are meant to increase manageability and reduce frizz while still being free of parabens and sulfates. These color safe products are for individuals with curly, thick, coarse, frizzy, or unruly hair who wants to achieve silky smooth results! Straight Shampoo: An ultra mild cleanser that reduces pesky fly aways, helping smooth and soften the hair to make more manageable right out of the shower. Straight Conditioner: This is a light and thorough conditioner that adds shine and encourages body and movement for lasting smoothness. Apply through clean, wet hair and rinse! Straight Blow Dry: A light weight heat protective and heat activated styling balm! Its non greasy formula tames fly aways, frizz, and protects hair from heat and humidity. With this three product system, you will see your hair will be left lustrous and silky smooth!